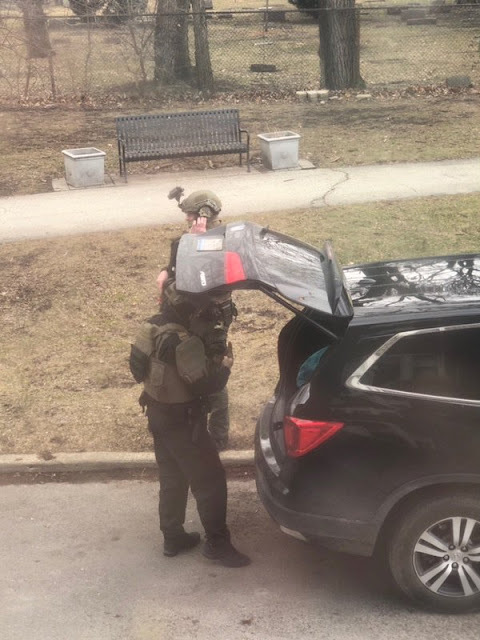 An Uptown man threatened to shoot a Cook County Sheriff who tried to serve eviction papers on Wednesday afternoon, leading to a SWAT response. The man is in custody and no injuries were reported. CTA bus and Red Line service, which had been halted in the area, were resuming normal activity at 3 p.m. The nearby Horace Greeley Elementary School went on lockdown during the incident, but police said the school administrators took that action on their own, not at the direction of police. Just before 1:30 p.m., a Cook County deputy tried to present eviction papers to a 32-year-old man at 4010 North Kenmore, according to police and a department source. The subject then threatened to shoot the deputy, who called Chicago police for assistance. The sheriff said that the man claimed to have a weapon and said he would shoot anyone who walked in front of his building. About 20 minutes later, the man reportedly threatened to burn down the apartment complex where he was holed up. The threat drew a large fire department response to the area, further hampering travel for motorists and pedestrians. SWAT officers were heard breaking glass in the apartment building around 2:45 p.m. Minutes later, the man was in custody. CWBChicago has learned that police responded to the man’s apartment in January for a methamphetamine-fueled act of violence that left the man injured. We are withholding the man’s name because charges have not yet been filed in today’s incident. After being taken into custody, the man declined treatment by paramedics. Police later took him to Advocate Illinois Masonic Medical Center when he complained of shortness of breath. CTA Red Line trains were held at Sheridan and Wilson during the incident because the track runs directly behind the man’s second-floor apartment. Service resumed at 3 p.m. Affected buses—the 22 Clark; 36 Broadway; and 151 Sheridan—resumed regular routing by 3:30p.m.